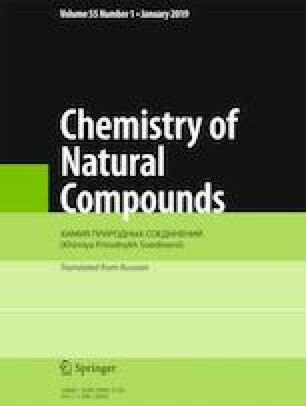 A new flavonol glycoside, 8-methoxykaempferol-3-O-α-L-rhamnosyl-4′-O-β-D-glucoside (1), was isolated from the fruits of Cercidiphyllum japonicum (Cercidiphyllaceae) in addition to two known anomeric galloyltannins, [2,2′,5-tri-O-galloyl-α/β-D-hamamelose (2) and 3,4,6-tri-O-galloyl-α/β-D-glucose (3)], and one known flavonol [quercetin (4)]. The structures of the isolated compounds were elucidated using chemical and spectral methods. Published in Khimiya Prirodnykh Soedinenii, No. 2, March–April, 2019, pp. 217–219. The authors thank the Foundations of State Key Laboratory of Tree Genetics and Breeding (No. K2017101) and Guangxi Key Laboratory of Clean Pulp & Papermaking and Pollution Control, Guangxi University (No. KF201801-5).